HIIT : I mowed the lawn on the Hare setting – does that count? Some time ago I won a competition to have lunch at a London Pop-Up restaurant – there are two things here …. I have never visited a Pop-Up and I have NEVER won a competition so when I received an email from the team at The Nudge to say I had won lunch for four people I was ridiculously excited, the sort of excitement that keeps you awake at night – at my age I really should get over this level of elation. The Nudge is a brilliantly edited Guide to Cool London, specialising in pop-ups, unusual bars, restaurants and new launches. When I signed up I just happened to enter the competition …. AND I WON #shrieks …. Sunday Dinner (technically it’s lunch, but the theme was Sunday Dinners, the Nudge website assured me this was a Northern thing) for four including a bottle of wine (could it get any better?) …. I checked out the website and this place is Super Cool …. How are we four, husband and two game pals, going to fit in? This place is quite obviously for the young and cool Hoxton set. On a fresh Sunday morning in February we set off, purchasing our group travel South West Train tickets (could we feel any more middle-aged?) and headed to the big Smoke (you do realise real people who have a life never call London the Big Smoke, don’t you?). Grayshott, Waterloo, Old Street and then on foot to Hoxton Square passing The Breakfast Club with those louche young things who had just fallen from their beds sated and slightly hungover from the previous nights’ revelry, it was lunchtime and the breakfast queue was just starting to snake round the corner. We oldsters with our regimented breakfast, lunch and supper internal dinner bells who must eat within the given time allocation or thence after suffer various debilitating digestive ailments were primed to take our midday repas at the stroke of Noon. We had arrived early to the venue, this happens when you reach a certain age, you become anxious that despite having an A-Z, Google Maps and an iPhone that does pretty much everything for you, you are convinced that there is some impending disaster that will halt you in your tracks and you will never find your end destination in the given time – my travel and eating companions have a few years on me and of course they were the ones driven with anxiety … I was just hungry! So we arrived at our destination on Hoxton Square EARLY. 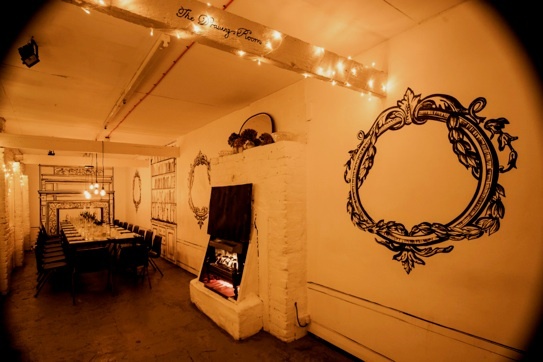 It was pointed out by one of my companions that the venue did not look like a restaurant at all and in fact was more akin to “a snuff movie set” …. The Dead Dolls Club moniker did nothing to allay our fears. So when our reservation time neared we approached the speakeasy door and knocked hesitantly. In actual fact there was nothing libidinous about the venue once inside – we were just the first to arrive! We were welcomed in by achingly young, hip and beautiful waiters and waitresses and shown to a large community table upstairs in the Drawing Room. The building itself can best be described as pre-loved. the ‘temporary caretakers’ of this old textile factory have created a magical interior of whitewashed walls embellished with black marker pens to create monochromatic panelling, baroque fireplaces and old style clocks … this is Sharpie art on a whole new level. As the lunchtime crowd arrived and our table filled, we were joined by varying sized groups, a young couple in love – probably not best placed in the centre of the table as they created an unyielding divide between each end and it seemed rude to try end disengage them from their smooching. But we were joined by two gorgeous Danish students living in London. Whilst we all started with our complimentary wine they enjoyed cocktails and so any shyness was washed away as we all imbibed more alcohol on empty stomachs. Conversation was lively and varied, the two girls who were similar ages to our own children were bright, engaging company and in fact 6 months later we are still in touch – we are hoping to drag them out to the ‘country’ and show them just how crazy village life can be! Our topics of discussion included politics, media, religion and the merits of red trousers ….. there is a maritime tradition that red trousers may be worn by those that have sailed across the Atlantic – in which case there are a lot of gentlemen of a certain age residing in the shires that have made this epic journey???? Lunch was a set menu, created by Terry Edwards of Check On who trained under Mark Hix. Priced at £25, and I know we didn’t have to pay, but if we had, this was great value …. Check On Nuggets served in a KFC style box with Bloody Mary Ketchup as a Starter, Egg & Sweetcorn with crispy chicken skin, (infinitely more delicious than it sounds), followed by corn fed chicken breast stuffed with sage, lashings of fresh vegetables and roasties served on huge enamel platters and a lemon pudding plate of cake, verbena marshmallow, curd, lemoncello jus and a sherbert & thyme something, that was all lusciously tart …. Service was bustling and the atmosphere fun, friendly and inclusive. To not be part of the tables mixed-group dynamic and conversation was to miss out on an important part of the experience. This is not just lunch, it is very much an ‘experience’ and whilst this particular theme is over, there are always other Eating opportunities. We ended our meal with divine Espresso Martinis on the recommendation of our two new Danish dining friends – frankly I’d rather have one of these than a pudding if the choice is there! And then bid a fond farewell to the two lovely girls as we all spilled onto Hoxton Square, as the last to leave through the unmarked prohibtion door. Have you tried somewhere a little off the beaten track or unusual? Do tell ….